Leading Exporter of paper coasters from Mumbai. Backed by our experienced team of workers, we are providing a qualitative range of Paper Coasters. 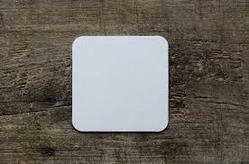 These coasters find extensive application in all-star hotels, clubs, bars and also as a medium for advertisement. Our range is available in various sizes, shapes, and thickness to meet the diverse needs of the clients. Further, we offer these boards at highly competitive rates.